Just as one has respect for a loaded gun...the same respect is due a martial art with the potential to also kill! Bow toward shomen when entering or exiting the dojo. Remove shoes and socks when preparing to train. Bow and show respect to Shihan, Sensei and Senpai. While it is not required to bow to other students lesser in rank than Senpai, it is still important to show respect. When musubi is called, move quickly to your place in line and immediately cease all conversation...it is now time to train. When doing kata, be conscious of others around you. 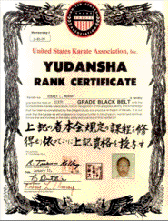 Always make room for higher ranking students during kata. NEVER lean on the wall when sitting down watching a demonstration. DO NOT cross your arms while watching a demonstration; place your hands behind your back or at your sides. Crossing your arms in front of your chest is a sign of disrespect. DO NOT TALK while Shihan or Sensei are talking; instead, pay attention to what is going on, it is probably very relevant to your training. Always remember: the dojo is where you train your mind and body to excel; treat it with respect!